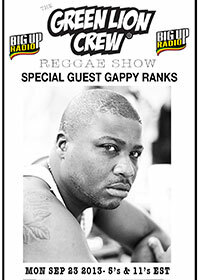 This September 23rd on the Green Lion Reggae Show we interview none other than Gappy Ranks. All Gappy Ranks tracks for the whole hour as we discuss his past present and future. Find out which artist Gappy has to have in his dub box and more! His brand new album "Shining Hope" is in stores now. Catch the Green Lion Reggae Show every Monday on the dancehall station at bigupradio.com. The show times on Mondays are: 7am, 1pm, 7pm and 1am Eastern Standard Time. Recalling the ’90s — the heyday of British artists like Maxi Priest and Bitty McLean — singer Gappy Ranks brings U.K. reggae to world.